NASA’s Cassini probe has captured striking images from flying by three moons of Saturn, including new pictures of Enceladus’s gushing geysers. Cassini made its lowest pass yet over the south pole of Enceladus, at at an altitude of 74 km (46 miles). This allowed it to “taste” the jets of water vapor and ice that the moon spews forth into space. Cassini probe also made relatively close flypasts of two other Saturnian satellites: Dione and Janus. The observations were made over 27 and 28 March. The encounter was primarily designed for Cassini’s ion and neutral mass spectrometer instrument, which sampled the composition of Enceladus’s south polar plume. Other instruments, including the Cassini plasma spectrometer and composite infrared spectrometer, also took measurements. Before the closest approach to Enceladus, Cassini’s onboard cameras captured images of the geysers, which contain organic compounds along with the ice and vapor. The jets erupt from cracks, or hot fissures, at the south pole known as “tiger stripes”. 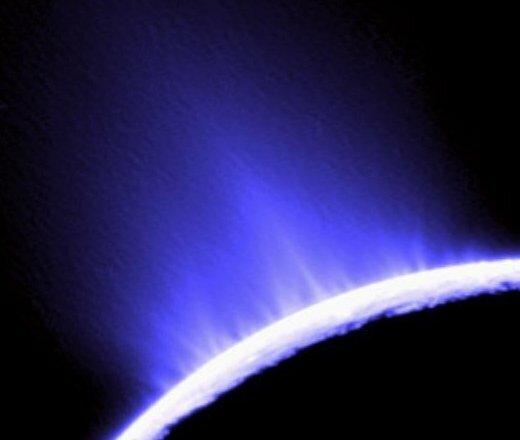 Several lines of evidence suggest the jets are fed by a liquid water ocean beneath Enceladus’ outer icy shell. Scientists have previously detected salts in these jets, which suggests the ocean is probably in contact with the moon’s rocky core. “Cassini has flown several times now through this spray and has tasted it. And we have found that aside from water and organic material, there is salt in the icy particles. The salinity is the same as that of Earth’s oceans,” said Dr. Carolyn Porco, head of the imaging team on Cassini. As the spacecraft passed Enceladus, the cameras made a nine-frame mosaic of the surface of Enceladus’s leading hemisphere. Cassini then flew by the small moon Janus with a closest approach distance of 44,000 km. The planet was in the background in some of these views. On 28 March, the spacecraft passed Dione at roughly the same distance and captured, among other observations, a nine-frame mosaic depicting the side of the moon that faces away from Saturn. Scientists recently presented evidence that Dione has features resembling tiger stripes and a cryovolcano, which erupts water-ammonia or methane instead of molten rock. It is unclear whether there is current geological activity at Dione, but, if so, it is almost certainly at a lower level than on Enceladus. The discovery that Enceladus probably harbors an ocean in contact with the rocky core makes this moon an even more important target in the search for life elsewhere in the Solar System. The rocks could furnish the ocean with the chemical ingredients thought essential for life. “The kind of ecologies Enceladus might harbor could be like those deep within our own planet,” Dr. Carolyn Porco said in an interview with NASA’s science website. The habitable zone on Enceladus might be comparatively easy to access by future robotic space missions. Dr. Carolyn Porco added: “It’s erupting out into space where we can sample it. It sounds crazy but it could be snowing microbes on the surface of this little world. The source of Enceladus’s heat appears to be Saturn itself. The moon moves around Saturn in a distorted, oval-shaped orbit rather than a circular one. This causes it to be pulled and squeezed by Saturn’s gravity, inducing the heat that enables geological activity on the icy moon.